For nearly three years we have been working on solutions for flooding in Poipet. 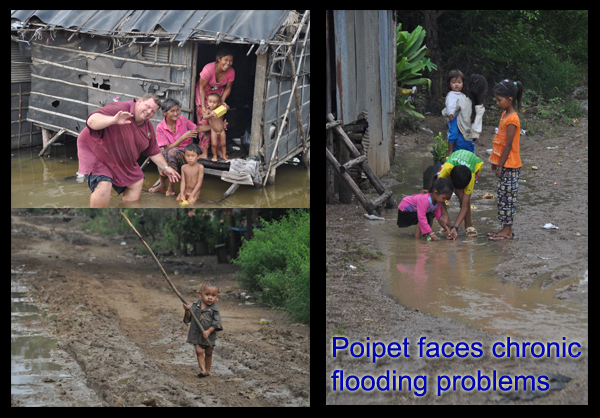 We have helped schools, communities and people all across Poipet get out of the annual floods which devastated the city. Long gone are massive floods which inundate the whole city, but there are still pockets of flooding left due to a lack of infrastructure. Once such pocket is near our children’s center in northern Poipet. A few hundred families’ homes are submerged in water for over six months every year, yet, because they have no place to go, they simply live in them. Once in a while a non-government organization gives donations of food, but few take any effort to solve the flooding problem. These issues are complex. While the American in me wants to pull a John Wayne rescue for the community, I must also work within the laws and culture of the land and with the community, otherwise the efforts will be futile. I also need to find solutions which the whole community is involved in, otherwise I will just have request after request for assistance until I have not a dime left in my pocket. Each day in Poipet I drive by this family, and dozens of others like it living in squalor in a flooded house. It is pitiful. Once in a while an organization will drive by and drop off some donations like rice, noodles and soy sauce. It’s not very helpful, but no one ever rejects free food. Yet, year after year, donation after donation, their house is still flooded. They still are sick from water-borne diseases. So I prayed about it and that day God opened a door. In an unrelated meeting I met with the Governor of Poipet City in the morning. In the meeting I briefly shared with him about the problem of water which was trapped in the northern part of Poipet which not only flooded part of the children’s center, but hundreds of other families as well. The village leaders had repeatedly made reports to request assistance, but apparently the reports, piled among hundreds of other request, were never acted on. In a quick response, the Governor said, “Anyway you can help us to alleviate the flooding we would appreciate”. I responded, that I felt the village leaders and myself together could find a solution. I almost jumped inside. As I left his office, I immediately started making calls. The village officials and I have been discussing the problem for years, and they had shared with me their solution. I immediately went to work and got a supply of concrete drainage pipes, located a working excavator, and called the village chief office. By the time I reached my car to drive to the site things were moving. Within 48 hours from that governors order the entire flooding in northern Poipet would be fixed, permanently. I drove straight to the village office, which is a one room-tin roofed shed of a building. The district chief’s desk is a discarded crate, the four chairs are plastic lawn chairs. The room has one light bulb. Clearly, they don’t have financial resources to fix this problem. However, they do have influence and knowledge of the local area. They know their village well. They are responsible for nearly 50,000 people. The solution was easy. Three years ago a new road was made which created a dam. It was built so high rain that water flowing from the higher northern side of Poipet would fill up and flood everyone on the north side of the road. The road had no culverts and so there was no way for the water to drain out. 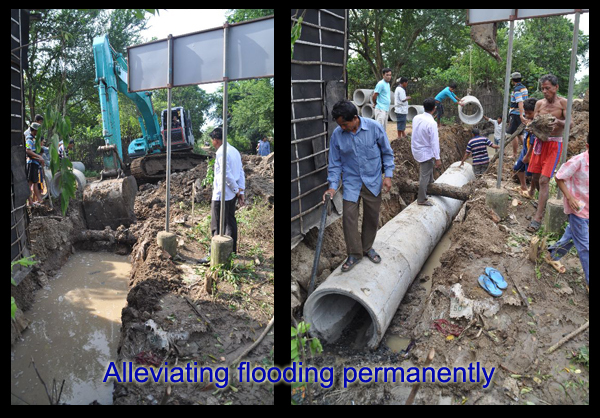 They said that 30 meters (100 feet) of concrete drain pipes would solve the entire flooding problem. I actually make drain pipes, so I know exactly how much they cost to make. Wow, in the sleepy city of Poipet where everything requires great patience, this was amazing. Now, I had to get the concrete drainage pipes on site as fast as possible. I made a couple more phone calls and amazingly everything was coming together. Within half an hour the dike was broken and we were laying drainage pipe to put in a permanent culvert. The whole community had gathered at the road to work to fix the problem. We worked right up until dark and continued the next day as the torrent of water flowed away from the flooded area. I would estimate the amount of water to be in the millions of gallons that had flooded hundreds of families for months. The water now was gone, permanently. It was not just myself that could take credit for the work, because clearly it was the favor of God for that time. 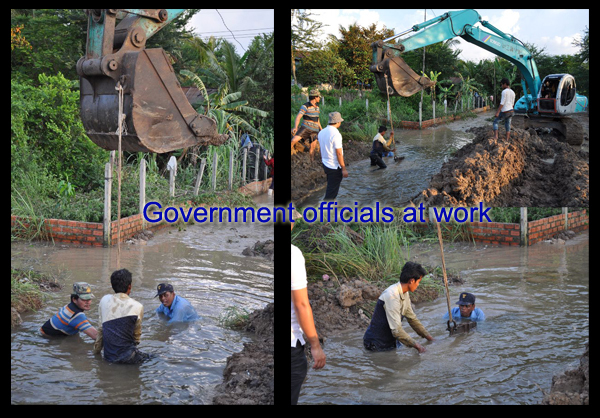 The government officials took off their pants and jumped right into the water to lay the pipe which at times was neck deep. The owner of the excavator loved his role and responded so quickly and only charged for fuel, not for his time over two days of work. The whole community helped moved a house, cut away vegetation and cleaned out the new waterway. It was a united effort to solve a community wide problem. How much did this operation all cost? A 60 cm pipe (2 feet) diameter pipe costs 400 Baht, or $13.50 per meter. There are 30 meters of pipe needed. The excavator agreed to do all the digging and trench work for another $300. We would install the pipes ourselves to save on labor. So, for about the cost of an iPhone, we permanently fixed the flooding problem which affected hundreds of families. After it was over I went back to visit some of the families who were previously flooded. They were so grateful that the flooding problem was solved. They admitted that donations had no effect on their lives, because, after all, they did have jobs and could buy their own rice and soy sauce. In our conversations many asked me why I bothered to help as I had no house being flooded or any interest in the matter. I explained to them that Jesus, who is my God and Master, tells me to help other people and it is because I love people that I want to help. While they had all previously heard of Christians before, they never understood anything about Jesus. Now they did. On the next Sunday, many of these families attended the local church for the very first time. Steve, I absolutely LOVED reading this!! What a blessing.